Wheels come in many different sizes and styles to fit all kinds of equipment. 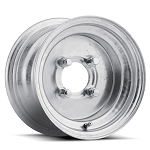 If you are looking for trailer wheels for your boat, cargo or utility trailer we have those in many different bolt patterns, carrying capacities and styles. Need Wheels for your golf cart, we have those too. Find your next wheel in our online tire store today. Click to see all the tires this wheel fits. Pete's Tire Barns carries wheels from many of the major wheel manufacturers, including Carlisle, Greenball, Unverferth and more. 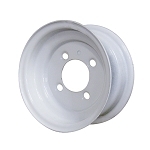 We also carry trailer wheels in both white and galvanized finishes. White Spoke, Modular, plain and more. Match the wheel you need to your tire size, bolt pattern and wheel style. Browse our full selection of wheels for all kinds and styles of equipment. 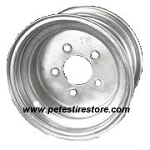 Trailers, Golf Carts, Lawn Tractors and more, wheels for all kinds and types of vehicles.